And get on a Deere forum. I will look into it when I'm back in town. Can you give me any contact info for Freedom Tire? Would you know if I can put the tractor on a car lift? If so, I can remove the tires myself, which should help. Also my car mechanic gave me a case of windshield washer fluid , he bought something like 100 cases to fill his tractor tires . He paid like 60 cents a gallon , never knew guys did that . It works and won’t freeze but it dry rots the tires eventually. Highway depts. using beet juice and molasses on road surfaces. Funny, how come it freezes in my trucks squirts but not in tractor tires. Not..
No matter what kind of dirt you have, a machine with the sole purpose of food plots and deer type prep, should have r1 AG's. There is zero advantage to turfs. Have fun walking back to the house to get chains once you bury it in the spring muck. Almost as cool as putting the chains on, in the muck. Then once they are on, and it still doesn't move, better hope the neighbors have AG's on their tractor. I've hunted almost everyday of my life.. the rest have been wasted! Did commercial truck and farm tires for a couple years back in my late teens . It's a young man's job for sure . Guy I worked for was in his 50s . He was all beaten and broken from years of abuse. It's a no brainer to hire it done. My brother worked in commercial tires for many years a long time ago. He told me a story about how they sent him on a job to change a skidsteer tire at beef fat rendering plant . . . . Worst one I did was a tractor tire in a field of fresh spread manure. Farmer tried to drive off a field and got stuck in a low wet spot. Blocking a tractor up in the mud took longer than tube and calcium chloride combined. Culprit for that tire was a deer shed . Took 4 of us 6 hrs to change.a tire on a scraper. That was just solid bull work . Culprit for that tire was a deer shed . That's why we need to kill them bucks before they can shed those horns. Hang them up in the house or barn and keep them tractor tires safe. The bb's may be safe from me this year, because I usually only end up with one every other year. I will not hesitate to send it, if any opportunities presents themselves, especially after reading about that tractor tire issue. The best way to save the tires is to nip them antlers in the bud. Whatever your reasoning is for laying off the BB's, I'm with it. Might even make u a t-shirt, "save the tractor tires"
Sounds cool. You make it, I will wear it. they loaded my tires. Just not sure with what. but the guy who dropped it off said that I would need spacers to run tire chains. If you have traction issues, there's a tool out there that cuts siping into the lugs on those r4's. Supposedly does wonders for Trac. Still won't compare to an ag lug but can help and be much less a pain than chains. 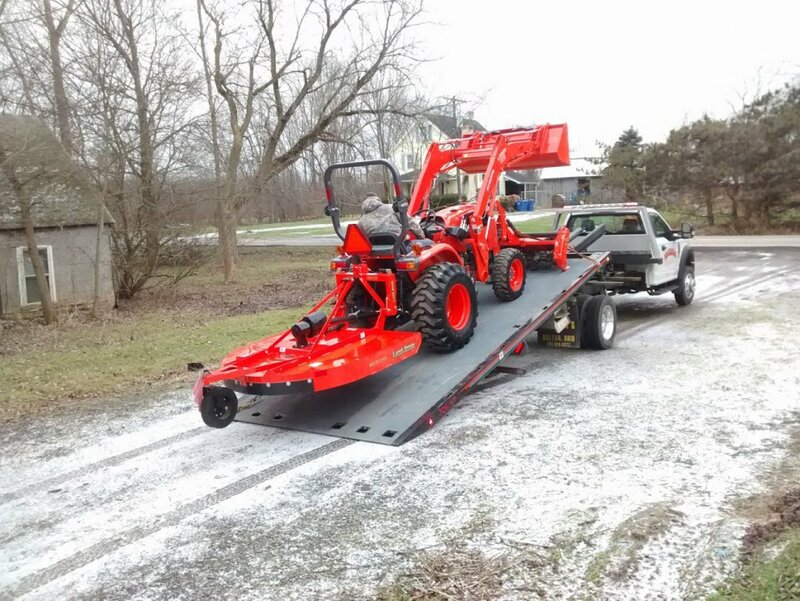 Is that a Kioti CK series? When I bought mine, they swapped the R4s that were on it for AGs for no charge. Was that delivered today from Niagara Implement?? No about a month ago from Niagara Implement.